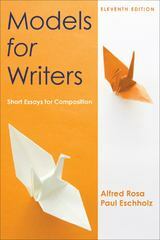 Models for Writers 11 Edition It’s a simple, best-selling combination that has worked for thousands of students — short, accessible essays and helpful, thorough writing instruction. Models for Writers continues to offer thought-provoking selections organized to demonstrate not only the rhetorical patterns that students will use in their own essays but also the elements and language that will make those essays effective. This edition offers more coverage of the key elements of academic writing, including new strategies for writing a research paper and a section on writing a reflective essay. Read the preface.